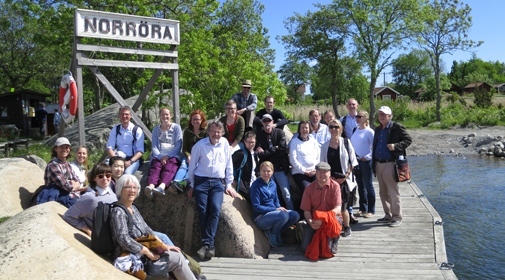 Department excursion at Norröra in the Stockholm archipelago. The Department of Human Geography at Stockholm University is a dynamic research setting. The research concentrates on three research profiles: The Stockholm Urban and Regional Research Environment (SURE), Historical Geography and Landscape Studies (FarmLandS), and Population Geography, Migration and GIS. Our researchers also teach at our courses and programmes. We offer courses and programmes in Human Geography, Urban and Regional Planning, Geography, and Globalization, Environment and Social Change. The first Chair of Geography in Stockholm was established in 1929. Stockholm University has housed a Department of Human Geography since 1955, when the former Institute of Geography was divided into two departments, one scientific department (Physical Geography) and one social-scientific department (Human Geography). In 1960 the privately owned Stockholms högskola (Stockholm University College) was nationalized to become Stockholm University. The Department of Human Geography forms part of the Faculty of Social Sciences within the academic area for Human Science. Today, the Department employs about 50 people, 30 of whom are academic staff and about 15 post-graduate (doctoral) students. The total number of students during one year is about 500 including around 100 master programme students. Each semester 20–50 exchange students studies at the Department. The Department is located in the Geo-Science Building (Geovetenskapens hus in Swedish) on the Stockholm University main campus, Frescati, in the City of Stockholm, Sweden.